Dr. Burkitt, born in Ireland in 1911, became a surgeon at Edinburgh’s Royal College of Surgeons in 1938, and was assigned to work for the colonial Medical Services in Uganda, Africa in 1946.1 He served as the Government Surgeon of Uganda from 1946 to 1964. Here he discovered a cancer of the immune system, which carries his name – Burkitt’s lymphoma. 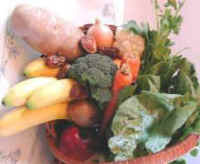 Historically, similar changes in disease patterns, as seen in Africa, have been seen as the diets of people in England, the United States, and most recently Japan, have switched to processed foods and animal products.2-4 There are many more important qualities to the plant-based diet of Africans than the fact that it was high in dietary fiber. The African diet has been traditionally a diet based on grains, legumes, vegetable and fruits – his patients ate very little meat, dairy products or refined foods. This means the diet was very low in animal protein, fat and cholesterol, and high in complex carbohydrates, dietary fiber, and healthful phytochemicals.5-6 All these ingredients go together to define a healthy human diet – like that of Burkitt’s patients (and by no coincidence, The McDougall Diet). According to a law of physics (Laplace’s Law), the pressure within a cylindrical structure with a given wall tension increases with decreasing radius.13 In other words, contractions at small diameters cause high pressures. The remnants of digestion on the Western diet produce only a small mass, and therefore, high pressures.14 Years of elevated pressures produce ruptures in the walls of the intestine, making balloons, called diverticula. A change to a high fiber diet will greatly reduce the risk of future bleeding and infection – in other words, people with diverticular disease have much less trouble after they change to a healthy, high fiber, plant-based diet.15 However, the diverticula do not disappear with a change in diet. 2) Taylor R. Management of constipation. 1. High fibre diets work. BMJ. 1990 Apr 21;300(6731):1063-4. 7) Friedman GD. Appendectomy, appendicitis, and large bowel cancer. Cancer Res. 1990 Dec 1;50(23):7549-51. 12) Painter N. Diverticular disease of the colon, a 20th century problem. Clin Gastroenterol. 1975 Jan;4(1):3-21. 15) Leahy AL. High fibre diet in symptomatic diverticular disease of the colon. Ann R Coll Surg Engl. 1985 May;67(3):173-4. 16) Burkitt D. Varicose veins, deep vein thrombosis, and haemorrhoids: epidemiology and Suggested aetiology. Br Med J. 1972 Jun 3;2(813):556-61. 18) Brisinda G. How to treat haemorrhoids. Prevention is best; haemorrhoidectomy needs skilled operators. BMJ. 2000 Sep 9;321(7261):582-3. 19) Ogendo SW. A study of haemorrhoids as seen at the Kenyatta National Hospital with special reference to asymptomatic haemorrhoids. East Afr Med J. 1991 May;68(5):340-7.